Purpose: To pronounce God's judgment upon Israel, the northern kingdom, for its complacency, idolatry, and oppression of the poor. Setting: The wealthy people of Israel were enjoying peace and prosperity. They were quite complacent and were oppressing the poor, even selling therm into slavery. Soon, however, Israel would be conquered by Assyria, and the rich would themselves become slaves. Special features: Amos uses striking metaphors from his shepherding and farming experience-a loaded wagon (2:13), a roaring lion (3:8), a mutilated sheep (3:12), fat cows (4:1), and a basket of ripe fruit (8:1, 2). Home: Tekoa (Amos 1:1), a town about 10 miles south of Jerusalem. Occupation: Sheep breeder (1:1), sycamore cultivator (7:14), and prophet during the reign of Jeroboam II (c. 793–753 a.d.). Best known today as: A prophet who denounced the northern kingdom of Israel for its idolatry, injustice, corruption, and oppression of the poor. Amos’ warnings of the Lord’s judgment came to pass when Assyria overran Israel a generation later. Word in life study Bible . 1997, c1996 (electronic ed.) (Am 1.5). Nashville: Thomas Nelson. Served as a prophet to Israel (the northern kingdom) from 760-750 B.C. Israel was enjoying peace and economic prosperity. But this blessing had caused her to become a selfish, materialistic society. Those who were well-off ignored the needs of those less fortunate. The people were self-centered and indifferent toward God. Amos spoke against those who exploited or ignored the needy. Believing in God is more than a matter of individual faith. God calls all believers to work against injustices in society and to aid those less fortunate. Amos speaks with brutal frankness in denouncing sin. He collided with the false religions leaders of his day and was not intimidated by priest or king. He continued to speak his message boobly. God requires truth and goodness, justice and righteousness, from all people and nations today as well. 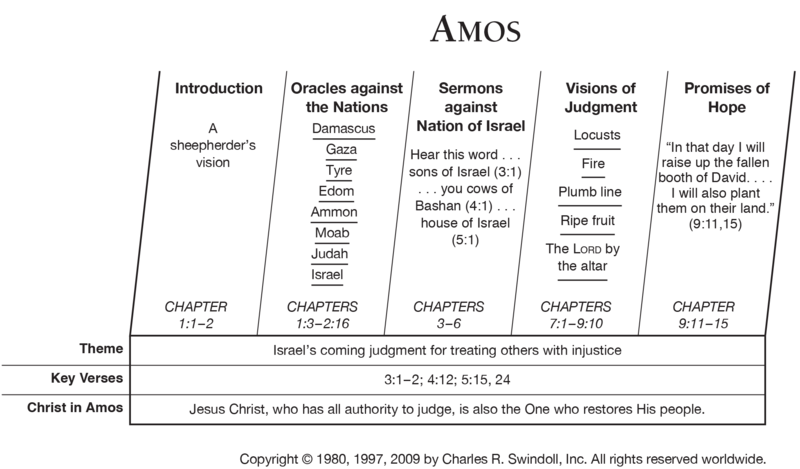 Many of the conditions in Israel during Amos's time are evident in today's society. We need Amos's courage to ignore danger and stand against sin.